We urge everyone who can to attend this next major London FBU rally just 10-15 minutes walk from London Bridge station. Protest at killer cuts being forced through by Tory Mayor Boris Johnson. 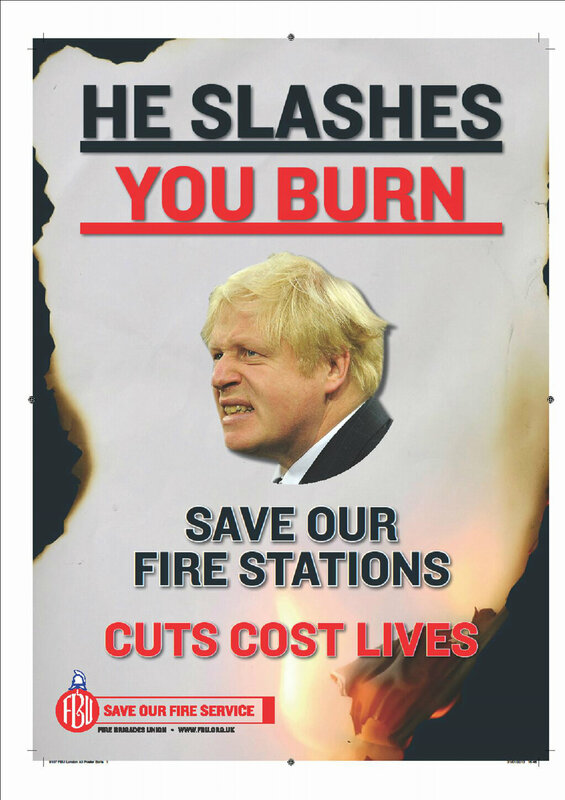 Against the advice of his own Fire Authority Johnson wants to close 12 fire stations, scrap another 18 fire appliances from other stations and sack 520 staff. Huge numbers of people commute into London daily from the South East. These cuts will put people from Sussex at greater risk. Supporters from Brighton & Hove will meet at Brighton station at 10.30am and travel up to London on the 11.04 Thameslink service, which arrives at London Bridge at 12noon. Brighton & Hove Labour Party agreed to send its banner to the previous FBU rally so we hope to see it and other Sussex labour movement banners at this event.